Even among failed states—those countries unable to exercise authority over their territory and provide the most basic services to their people—Somalia stands apart. A country of some nine million, it has lacked a central government since the fall of Mohamed Siad Barre's regime in 1991. Poverty and insecurity are endemic. Less than 40 percent of Somalis are literate, more than one in ten children dies before turning five, and a person born in Somalia today cannot assume with any confidence that he or she will reach the age of fifty. Failed states provide fertile ground for terrorism, drug trafficking, and a host of other ills that threaten to spill beyond their borders. Somalia is thus a problem not just for Somalis but for the United States and the world. In particular, the specter of Somalia's providing a sanctuary for al-Qaeda has become an important concern, and piracy off Somalia's coast, which affects vital international shipping lanes, remains a menace. 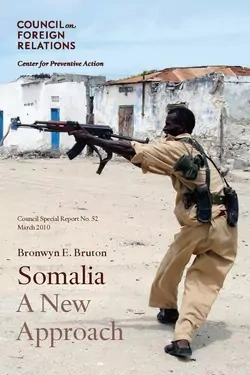 In this Council Special Report, Bronwyn E. Bruton proposes a strategy to combat terrorism and promote development and stability in Somalia. She first outlines the recent political history involving the Transitional Federal Government (TFG) formed in 2004 and its Islamist opponents, chiefly the Shabaab, which has declared allegiance to al-Qaeda. She then analyzes U.S. interests in the country, including counterterrorism, piracy, and humanitarian concerns, as well as the prospect of broader regional instability. Failed states provide fertile ground for terrorism, drug trafficking, and a host of other ills. Bruton argues that the current U.S. policy of supporting the TFG is proving ineffective and costly. The TFG is unable to improve security, deliver basic services, or move toward an agreement with Somalia's clans and opposition groups that would provide a stronger basis for governance. She also cites flaws in two alternative policies—a reinforced international military intervention to bolster the TFG or an offshore approach that seeks to contain terrorist threats with missiles and drones. Instead, Bruton advances a strategy of "constructive disengagement." Notably, this calls for the United States to signal that it will accept an Islamist authority in Somalia—including the Shabaab—as long as it does not impede international humanitarian activities and refrains from both regional aggression and support for international jihad. As regards terrorism, the report recommends continued airstrikes to target al-Qaeda and other foreign terrorists while taking care to minimize civilian casualties. It argues for a decentralized approach to distributing U.S. foreign aid that works with existing local authorities and does not seek to build formal institutions. And the report counsels against an aggressive military response to piracy, making the case instead for initiatives to mobilize Somalis themselves against pirates. Somalia: A New Approach takes on one of today's most vexing foreign policy challenges, offering concise analysis and thoughtful recommendations grounded in a realistic assessment of U.S. and international interests and capabilities. It is an important contribution to the debate over how to proceed in this most failed of states.